Transverse flute in C by Johann Joachim Quantz, Potsdam, between 1740 and 1760. In 1739 Johann Joachim Quantz started to make flutes himself, as we can read in his autobiography. In his view there was a lack of good flutes. 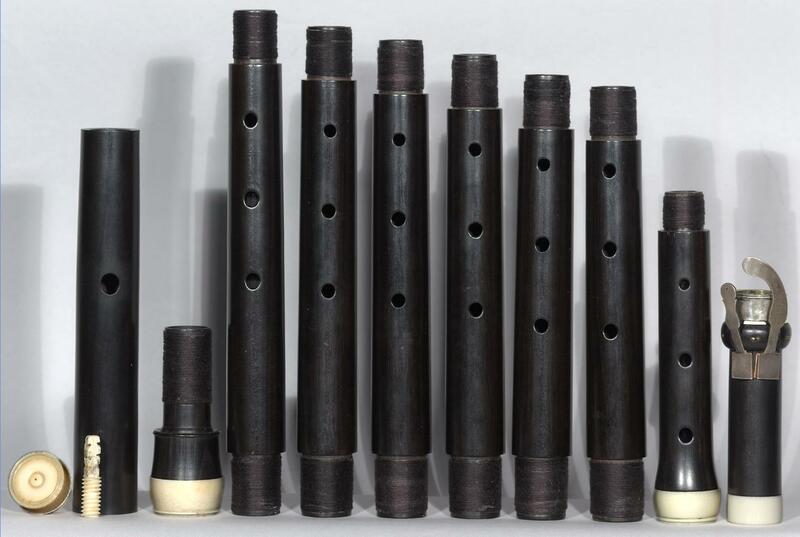 Quantz recommended hard woods for the making of flutes, such as boxwood, ebony, “Königholz” (lignum regium), guajak wood (lignum sanctum) and granatille. He regarded boxwood to be the most durable and ebony to render the most beautiful and clearest tone. He built as many as eighteen instruments for Frederick the Great during his employment. Due to Frederick’s habit of giving these flutes away as a mark of special favor, many of them survived as heirdooms in Prussian noble families, and are today presented in museums in Germany, the US and Japan (www.flutehistory.com). While in Paris (1726) he for the first time had a second key added to his flutes to improve their intonation. “As yet the flute had only one key. When I gradually learned to understand the peculiarities of the instrument, however, I found that there remained a slight impurity in certain tones, which could be remedied only by the addition of a second key. I added this second key in the year 1726.”. Translation: Edward R. Reilly, On Playing the Flute. However his invention was hardly retained by other flutists. The German virtuoso, writer and flutebuilder Johann George Tromlitz (1725-1805) also built flutes with this second key after the example of Quantz. In some literature is mentioned that Quantz also invented the screw-cork. With the screw-cork it’s possible to make fine adjustments to position of the cork stopper in the headjoint relative to the embouchure hole. Quantz adopted the screw-cork in his own flutes. In his method of 1759 “Nouvelle Méthode pour Apprendre en peu de tems a Joüer de la Flute Traversiere” Antione Mahaut attributes the invention of the screw-cork to Buffardin. The ultimate design and execution of Quantz’s flutes does owe much to the work of some early eighteen-century Parisian makers (workshop of Pierre Naust), but we can only guess about any exchange of ideas that might have taken place. (Cit. “The flute“, Ardel Powell, p.95). In the 1750s Quantz incorporated a new device of more lasting value: a tuning-slide in the head joint of the flute, enabling the flute to be lengthened or shortened without recourse to the customary interchangeable centrepiece. It can’t be verified if Quantz invented the tuning-slide himself or was just the one who first had it applied on a large scale, but in any case it is used to this day. Quantz claims it as his invention in his autobiography. “Shortening and lengthening of this kind could be better introduced in the head piece than in the foot, that is, by dividing the head piece into two parts, and making the tenon of the lower part a little longer than that of the middle part. By inserting this tenon into the upper part of the head, the head can be made shorter or longer without detriment to the intonation, and the advantage sought for in vain through the aforementioned invention can be obtained with ease. I have tested this myself, and fount it trustworthy.” Translation: Edward R. Reilly, On Playing the Flute . A detailed illustration of the head piece, as invented by Quantz, is presented in the Recueil de plances, vol. xii, of Diderot’s Encyclopédie, where it was used to illustrate an article on Quantz flutes in vol. III (1777) of the supplement. Quantz Flute and head piece with screw-cork and tuning-slide. Source: Recueil de plances, vol. xii, of Diderot’s Encyclopédie ..
Another main feature of the Quantz flute is its enormous bore: wider than any other Baroque flutes over its entire length, but especially in the head-joint. This produces a very low register. Quantz believed the flute should most closely resemble a contralto voice. Library of Congress in Washington contains a Quantzflute (BCM 0916) that once belonged to King Frederick II of Prussia. It belongs to the Dayton C. Miller Collection of Wind Instruments. 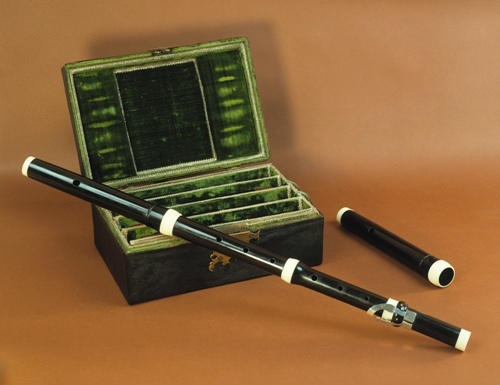 For more images of the flute and it’s porcelain case visit the site of the Library of congress . Source: Die Flötenmacher Friedrichs des Großen – Ein Beitrag zur Geschichte der Holtzbauinstrumente. Von Dr. J. Zimmerman. In: Zeitschrift für Instrumentenbau, Bd. : 60, Leipzig, 1939-40. See also the article “The Quantz Flute” by Eberhard Dehne-Niemann in Traverso, October 1997 and Tabia (1997, Heft 1, p 365 and Heft 2, p 444) and Mary Oleskiewicz’s reply to Eberhard Dehne-Niemann in Tabia (1998, Heft 2, p 163-164). 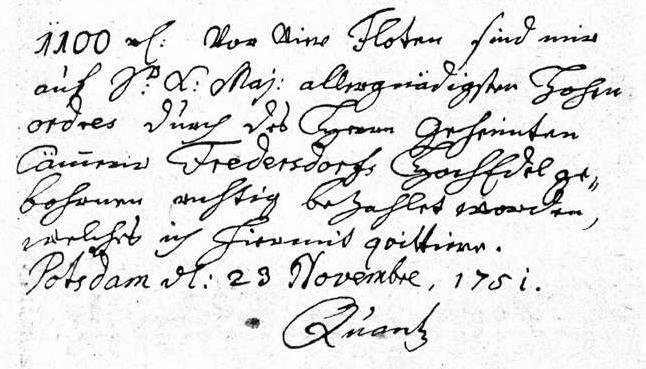 See: “Johan Joachim Quantz“, chapter: “Der Flötenbauer Johann Joachim Quantz, p. 42-49 of Meike ten Brink.